From 4000 to 1000 B.C., agricultural communities flourished throughout Eurasia with systematic irrigation supporting ever-larger populations in the fertile valleys of the Nile, Tigris, Indus, Euphrates and Yellow Rivers. 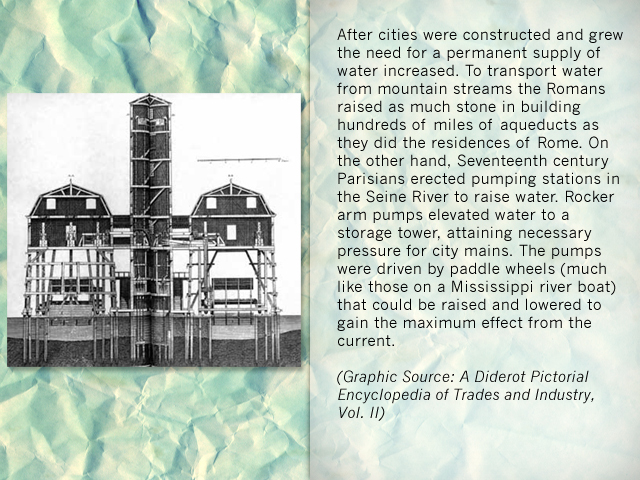 Here, the first cities were born to house the diverse trades coming into being – farmers, builders, those who stored, accounted for and sold surpluses. The administrative and commercial needs led to the rise of class differentiation and bureaucracies, then merchants, traders, priests, princes and kings. Ever larger storehouses and public buildings, then palaces, were constructed as well as a variety of dwellings according to the requirements of the variety of emerging classes. 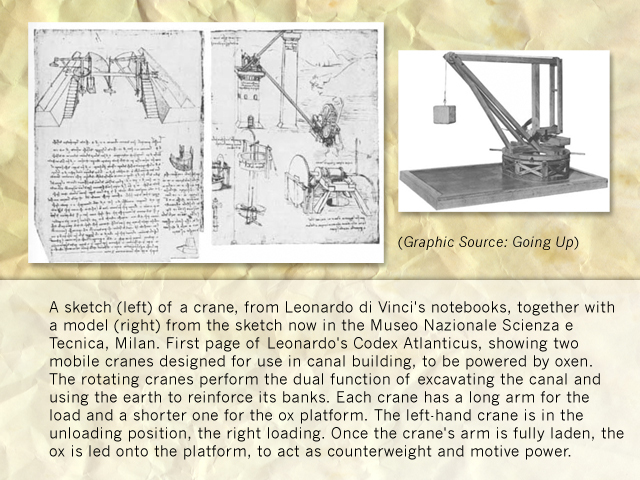 The lifting of earth and stone to create cities and their contents became as important as the elevating of water for the fields. The accumulation of wealth drew the attention of less affluent neighbors who developed means of storming cities for booty and for slaves to provide their manpower. 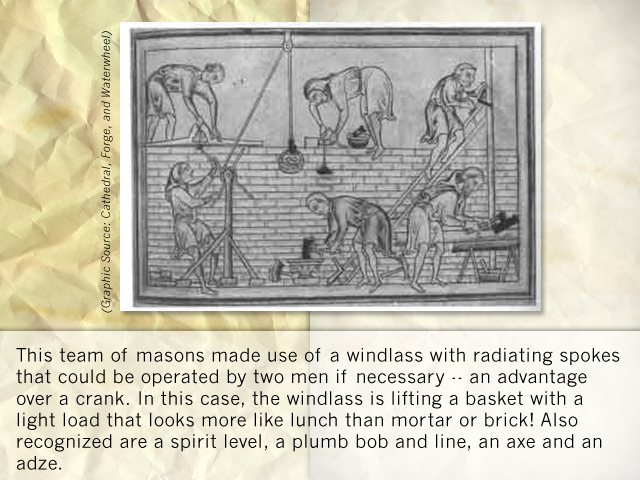 The cities responded with the building of ever thicker and higher defense walls and the creation of increasingly efficient construction tools and mechanisms. Better defenses led to improved offenses and a race began that had no end throughout history. Successes in conflict led to consolidations – small kingdoms, then powerful states and nations with rulers who required ever-higher monuments. Most structural memorials were to personalities; others to gods, then to God. 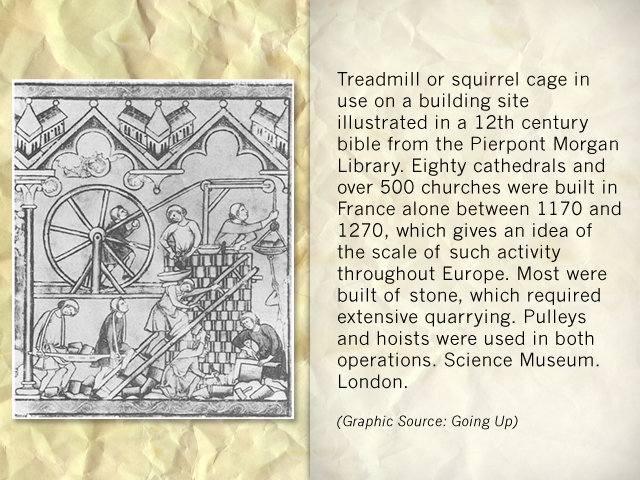 The requirements for city-building, trade and warfare led to the development of more efficient mechanisms with which to fell and dress timber and unearth/quarry, move and lift the material for walls and buildings constituting the city. 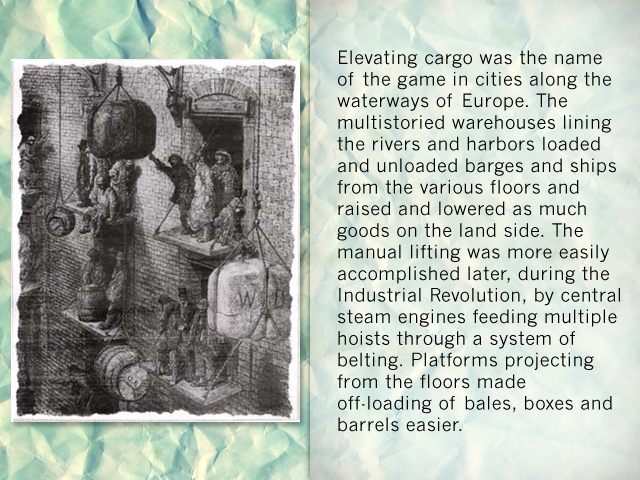 The acceleration of commerce brought larger warehouses, docks and machinery to lift and move large pieces and amounts of goods. 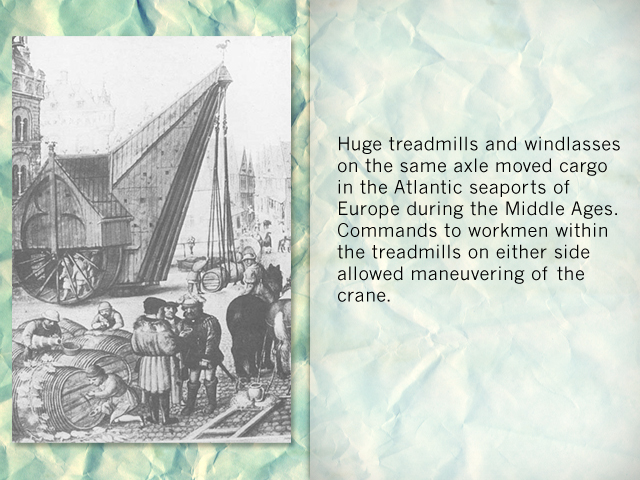 Burgeoning commerce led to the building of barges and ships, the raising of sails and the construction of roads and canals. Avarice brought warfare and the constant seesawing of ascendancy - the counterbalance of offense and defense and the special skills required. Beyond all this activity was the ego of hierarchies seeking long remembrance, or passage to eternal life. 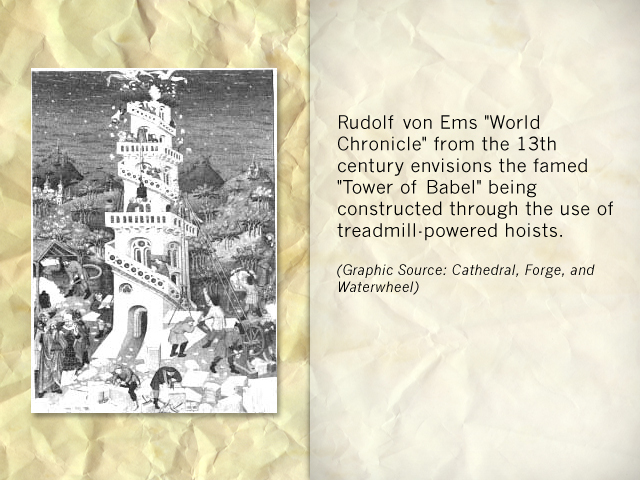 The erection of the "wonders of the world" included monuments worshipping a panoply of gods. 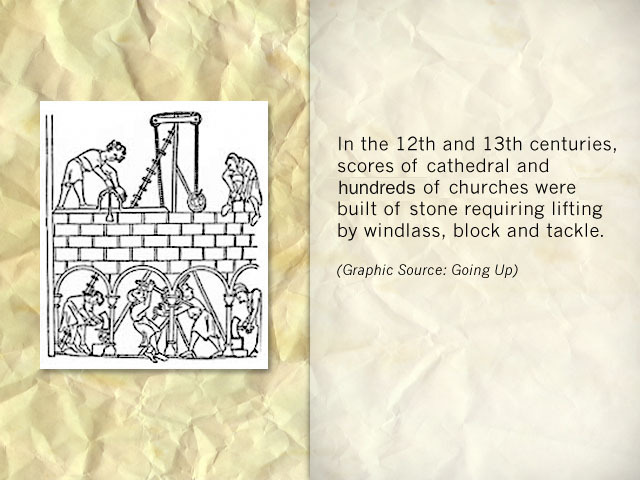 The construction skills were consequently honed in cathedral engineering and construction, sites worshipping the One God. 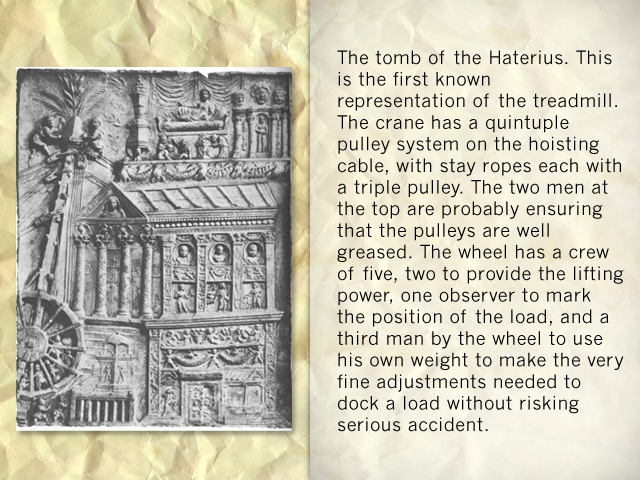 Some were to be the highest structures in the world. 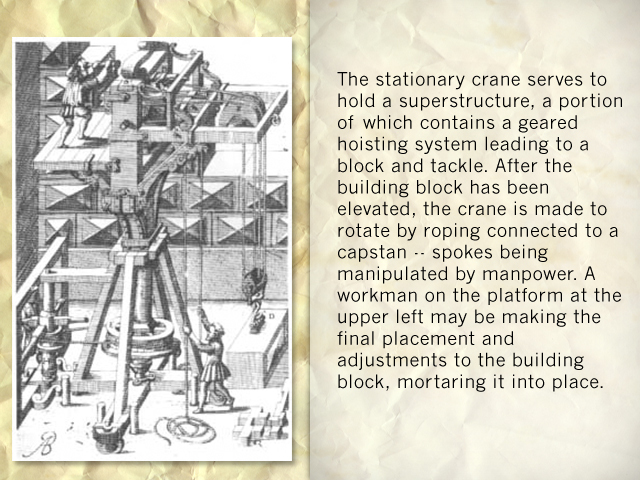 This preoccupation with construction led to a continual creation and improvement in combinations of gear types, pulleys, cranes, windlasses, counterbalances, clever leverage, blocks and tackles, and last but not least, improvement in the ropes, chains, cables and belting that expended the power of muscle, running water and wind. The primary requirement of man has always been production of food and shelter. 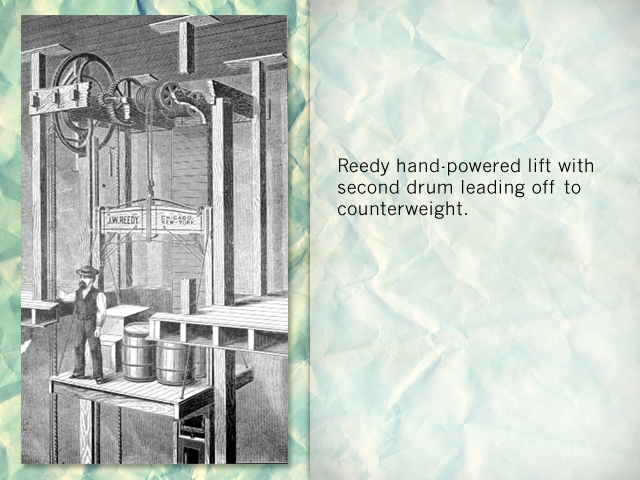 The earliest production was growing and grinding of grain. 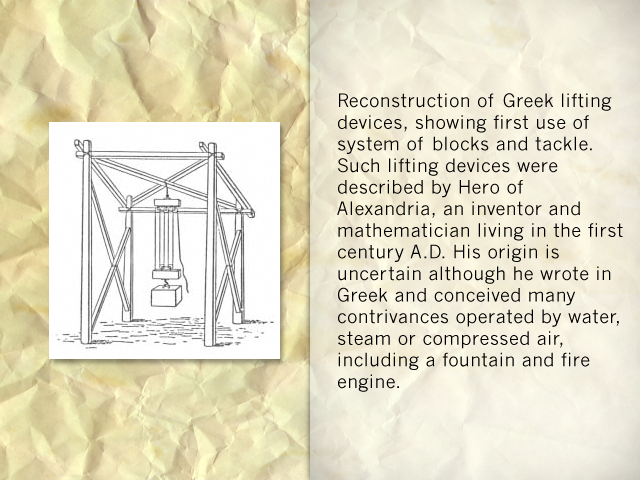 Next was the creation of building materials; then weaponry to defend the surpluses created. 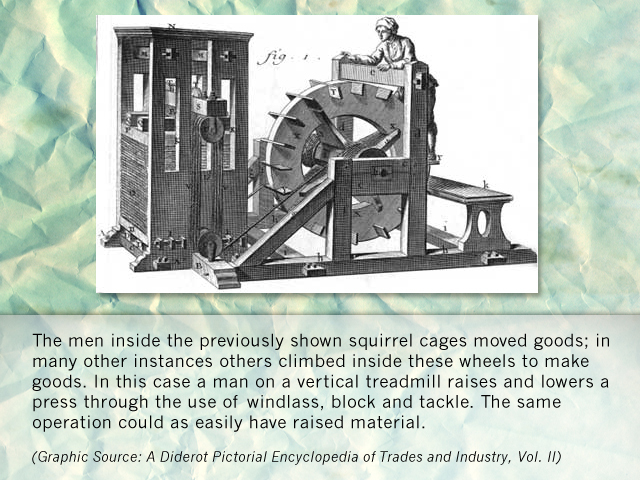 The power of falling water, and of wind, augmented that of man and animal in the grinding of grain and in the production of other materials. 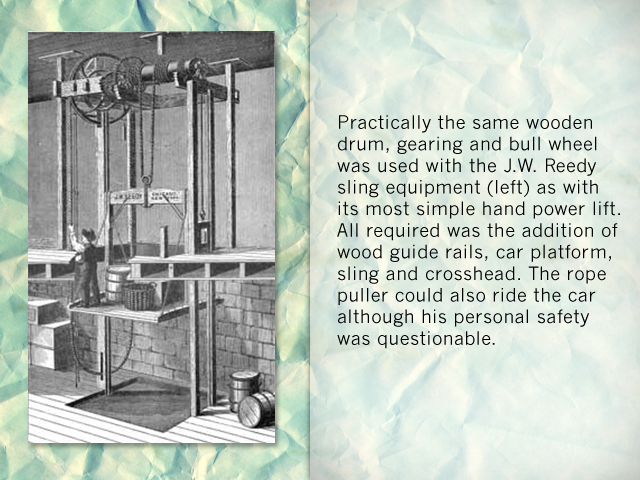 When more was created than needed, it was desirable to trade the surpluses of one area for differing kinds in others and commerce came into being. The easiest form of transportation in early times was by water and the great Eurasian rivers, along with the Mediterranean and Indian Oceans, became the first heavily used trade routes. 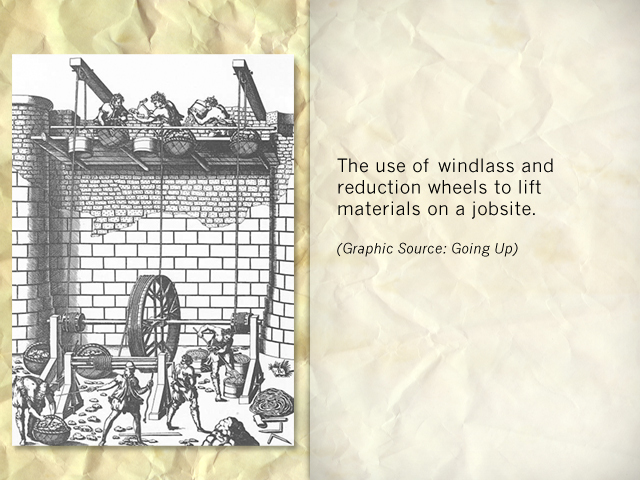 It was found that the same breezes driving the wind mills also propelled the vessels. 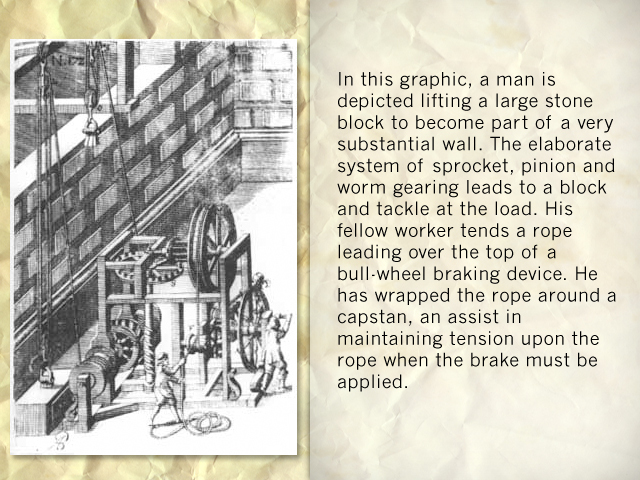 The hoisting and trimming of sails simplified the movement of cargoes. 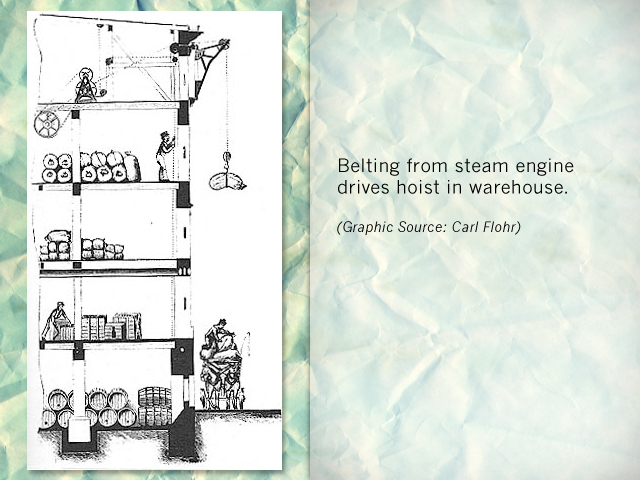 The clustering of urban populations at sea and river ports took warehouses and other commercial buildings higher and brought the means of moving cargo between storage and marketing buildings that were built ever higher to conserve precious urban space. 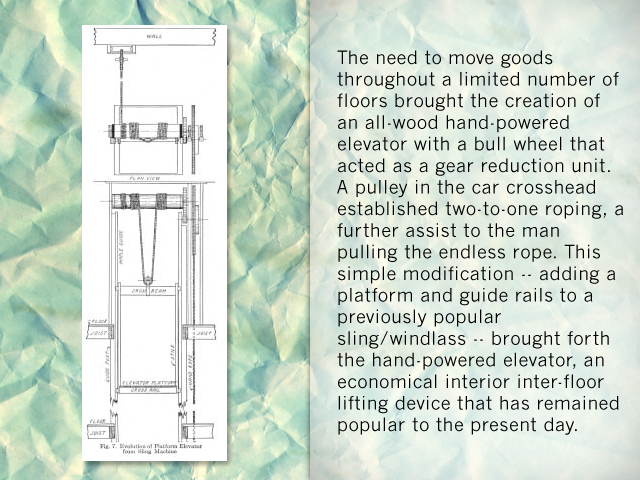 Efficient means of lifting were developed to move materials between producers and users by hoists, cranes and lifts as well as ships, barges and road vehicles. 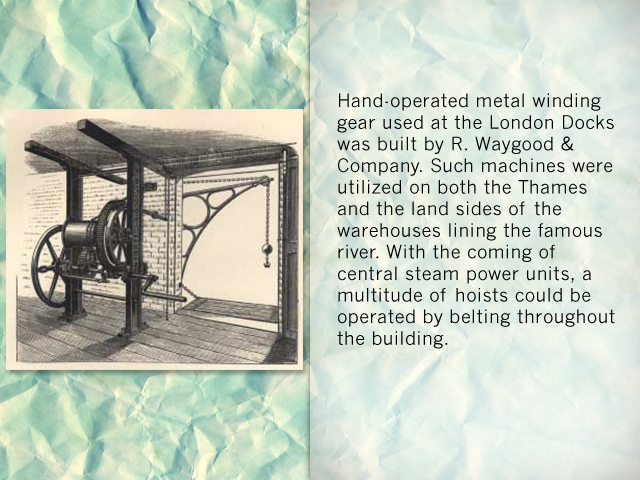 Eventually, mountains of earth were moved to create canals upon which barges could move throughout Europe, America and China and locks were built to raise and lower craft and speed the transport of commercial goods. 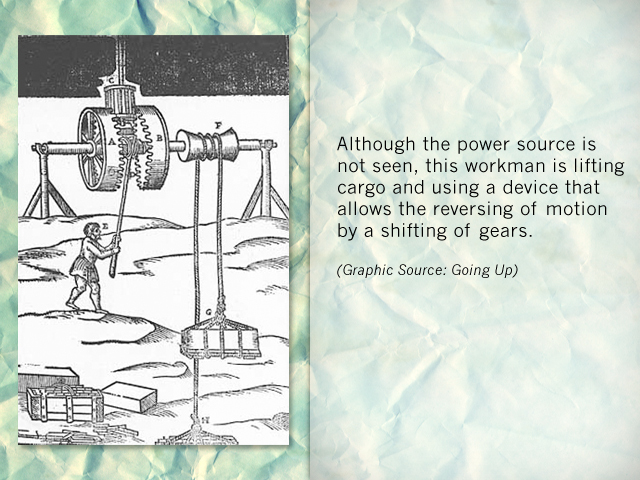 As with present-day radar, nuclear energy and penicillin, warfare has always accelerated the development of new products, processes and equipment. 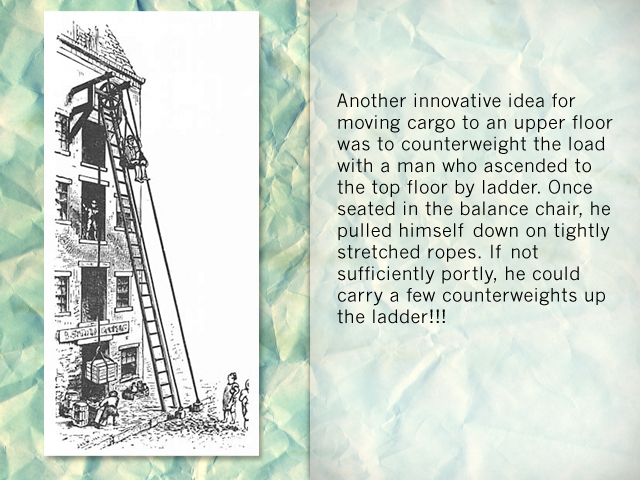 Necessity, indeed, is the mother of invention! And that thought necessary often brings conflict! The search for new hunting or grazing grounds no doubt brought the earliest confrontations between early man, prompting the development of hand weapons. However, the growth of the cities, trade and accumulated wealth spawned ever larger groups of raiders, then armies, to besiege these major sites of booty and potential slaves. 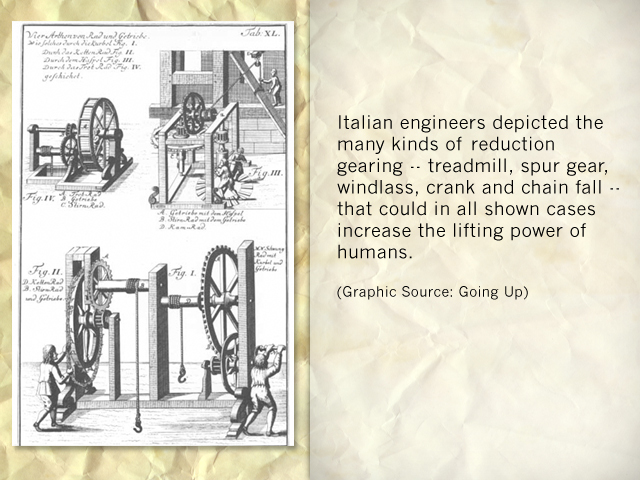 Threats to urban occupants on an ever-increasing scale brought a change in the nature of lifting. 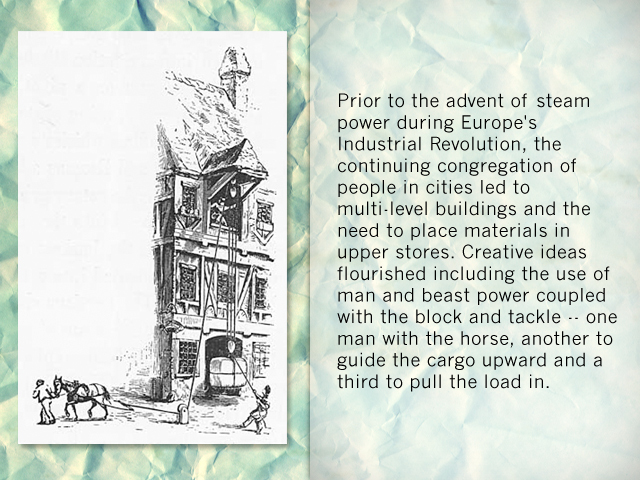 As life was threatened, as well as possessions, the elevating of earth, timber and stone to construct city walls was often frantic, requiring the mobilization of inhabitants. 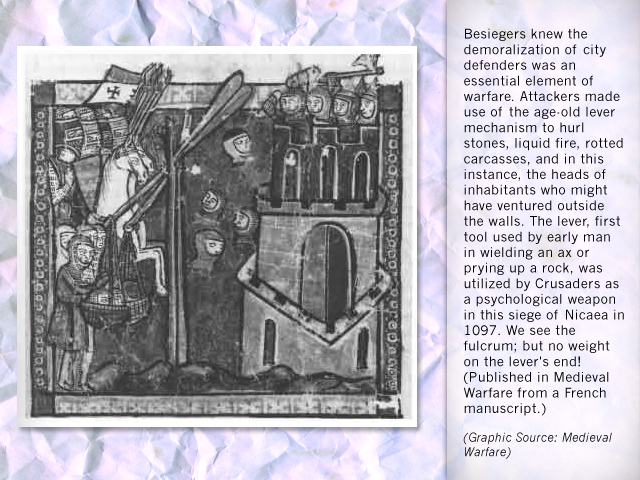 In many instances, more material went into the fortifications encircling a town than in the inhabitants' housing! 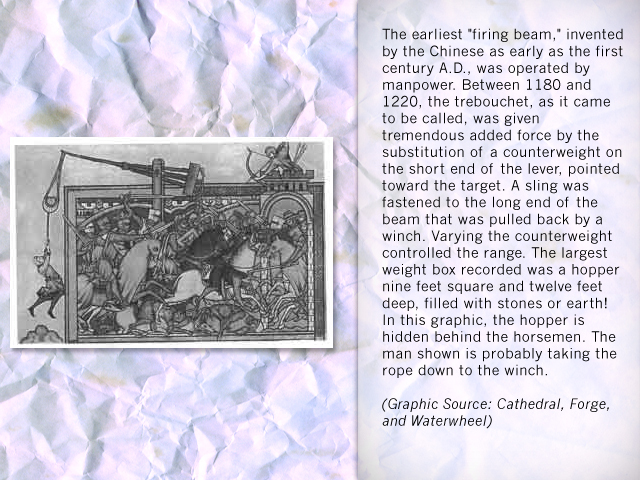 On a more expansive scale, some 300,000 laborers spent 800 years lifting earth, stone and brick in constructing the 1,500-mile-long Great Wall of China (25 feet high, 20 feet wide at the botom and 12 feet at the top), designed to protect the northern and northeastern portion of the country from Mongol incursions. 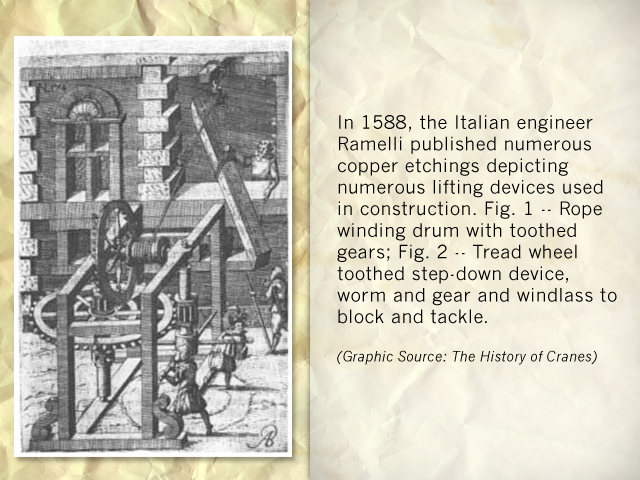 Historically, the pendulum has always swung between defense and offense. The higher the walls, the greater the ingeniousness given to breaking them down. 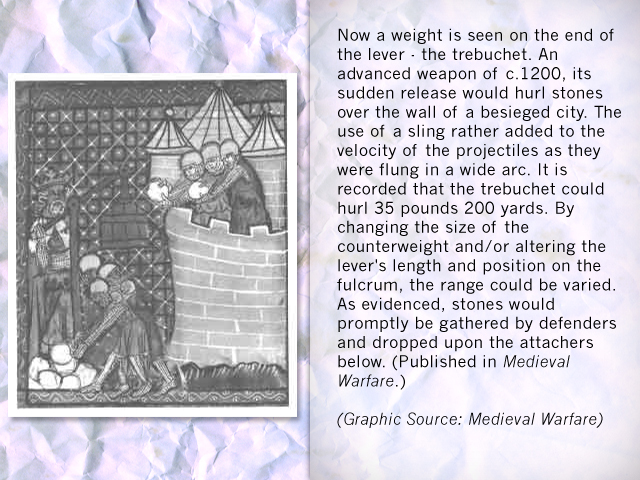 Catapults hurled projectiles against the walls, and multistory towers carrying attackers, were designed to be rolled against the walls. 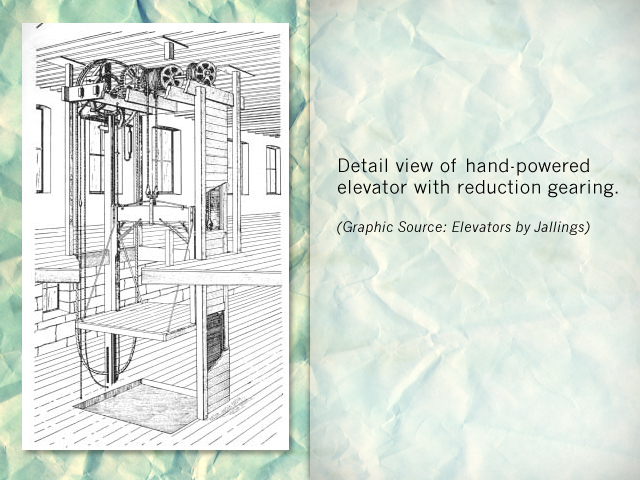 One graphic depicts a portable tower equipped with a rude lift to elevate attackers! Towers added to the utility of the city walls and finally, as in Italy, families or clans within cities constructed towers to scan the surroundings and protect the premises. 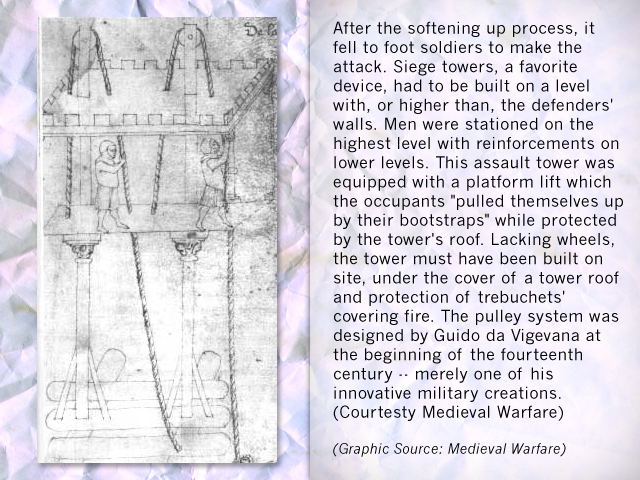 Castles that dotted the European countryside were literally a huge conglomeration of towers, walls and turrets -- a fortress -- designed to discourage or repel enemies.